How do I setup a public profile? 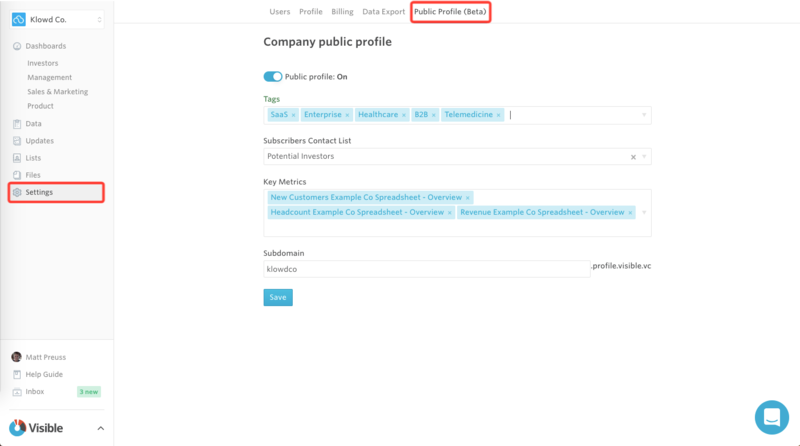 Public profiles are a way for you to setup a public investor relations page to highlight your most recent Updates, key metrics, and build a pipeline of potential investors. From here, you will see 4 different fields; Tags, Subscribers Contact List, Key Metrics, and Subdomain. Next, you will want to associate a "Contact List" with any new subscriptions you receive from your public page. In the image above, you'll notice a "Subscribe" button in the top right corner. Potential investors will be able to click "Subscribe" and enter in their email address. The list you choose will be where their email is placed so you can send future Updates to subscribers. We suggest creating a "Potential Investors" list to get started. Once someone subscribes you will receive an email notification letting you know someone new has subscribed. You can always delete the person from the Contact List as well if you would like. Towards the top of your profile you will see an "Updates Publish Frequency" chart. This simply shows how regularly you have sent Updates in the past; the darker the month, the more Updates you have sent that month. Additionally, you'll notice a "Recent Updates" section. This displays your 3 most recent Updates that have been shared "publicly" (e.g. link shared). Anyone on your public page will be able to click on the specific Update and view the content. Lastly, you'll see a "Key Statistics" section. From the "Settings" in Visible you'll be able to select any metrics you'd like to be shared on your public page. We will automatically display the most recent period's data for the respective metrics.